An unqualified accountant’s opinion for the third time in a row. THE BOTTOM - The Board of financial supervision of Bonaire, Sint Eustatius and Saba (Cft) concluded on June 28 that Saba still has its public finances in order. Even though 2016 was characterized by a number of financial setbacks plus the absence of some key staff members of the finance department, the 2016 financial statements show a surplus. Also, the auditing accountant has indicated that an unqualified audit statement will be provided. The Executive Council received compliments for this achievement. 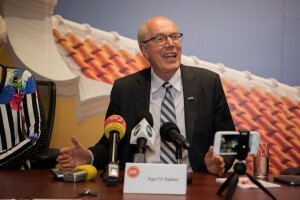 “Saba has once again proved to have its affairs well in order,” Cft Chairman Age Bakker stated. During the Cft visit on June 28, the Executive Council discussed the financial situation of the public entity, the financial downturns during 2016 and the budget execution in 2017. The year 2016 ended with a positive result of USD 69,063. This is shown in the 2016 financial statements, which will receive for the third year in a row an unqualified opinion from the accountant. The 2017 budget execution is going according plan, as can be seen in the first quarter progress report. The Cft further submitted a positive advise on the first budget amendment, as submitted in 2017. The Executive Council expressed its concern about the incidental funding of projects, which leads to structural burdens for the public entity, as is the case with the recycling plant. Cft also discussed with the Executive Council the BES pension legislation for (former) political officials. Due to various causes, this pension legislation has led to unexpectedly high costs in both 2015 and 2016. It has been agreed that the Cft together with the public entities will analyze the financial aspects of the relevant pension legislation more closely. This visit of the Board to Saba was also to bid farewell to the current chairman Age Bakker, who is departing as of July 1, 2017. Cft, together with the members of the Executive Council, looked back on a successful collaboration. The Cft chairman expressed his appreciation for the enormous steps taken by the public entity over the past six years. During the visit Mr. Herbert F. Domacassé was also introduced. He was appointed as the new Cft member on behalf of the public entities Bonaire, Sint Eustatius and Saba, as per July 1st, 2017. Starting July 1st, 2017 Cft Bonaire, Sint Eustatius and Saba will consist of Raymond Gradus (Chairman), Sybilla Dekker and Herbert Domacassé.